West, Mark D. “Considering Purposeful Epistemology: On Starting Over. Review of Epistemic Evaluation: Purposeful Epistemology.” Social Epistemology Review and Reply Collective 5, no. 9 (2016): 19-33. After the publication of Gettier’s seminal work on confounding cases in which individuals have beliefs which appear to be both true and justified, but which seem to not be knowledge, the epistemic community appears to have generally conceded that the traditional definition of knowledge as “justified true belief” can no longer be considered to hold. Cohen’s presents as a Gettier case the example of the farmer and the cow, in which a farmer sees a newspaper trapped in a bush, and thus believes she sees her favorite cow in a field; the cow is in fact in that field, but hidden behind a tree. Thus the farmer has justified true belief concerning the cow, since the farmer believes the cow is in the field, which is indeed the case; but has she knowledge? The answer, it seems, is no, since the means by which the farmer “knew” that the cow was in the field was faulty; but, paradoxically, the “justified true belief” conceptualization of epistemology would insist that the farmer in fact has knowledge—justified true belief. The more one considers Gettier’s brief paper, the more troubling its arguments become; knowledge requires warrant; warrants are fallible; if we then say that some justifications, while not ruling out all possibilities of error, plus truth, serve as a sufficient condition for knowledge, have we accomplished anything at all? Or has justification, as Fogelin argues, fallen prey to Agrippan skepticism? But once the pursuit of justified true knowledge is no longer the desideratum of epistemology, what are we, as epistemologists, to do? Perhaps Gettier did not intend to demolish an entire field of inquiry whose underpinnings, since Plato, had seemed straightforward, but intuitively that was the effect of the paradoxes he generated. And thus, epistemologists have sought to move forward through seeking entirely new approaches; we have, in effect, started over. A New Start for Epistemology? An example of starting afresh in epistemology is presented in the recent volume by Henderson and Greco that suggests that the way forward for epistemology is to consider why humans do epistemology. What is the purpose of epistemic inquiry? Beyond the laudable goals of understanding and inquiry for its own sake, why do we make epistemic inquiry? Epistemic inquiry, to be sure, is a human endeavor. Knowledge (in the sense of that which is corporately held to be true) is, somehow, distinguished from falsehood (in the sense of that which is corporately held to be false) in order for behavior to be coordinated in useful ways toward the completion of joint tasks. The authors call this the “full etiology view” of the purposeful epistemology approach, which is justified on the one hand by the linguistic turn’s understanding of language as a shared venture in which evaluation grows jointly with conceptualizations and utterances themselves (the totality of knowledge implied by Wittgenstein’s Die Welt ist alles, was der Fall ist) and in the sociological realm by the functionalist understanding of structures that persist as having needs which they serve as well as stressors which stimulate their activity. Such a “purposeful epistemology” might be considered as a continuation of the evolutionary program Craig describes in Knowledge and the State of Nature, where the concept of knowledge is imagined to have evolved out of the need of prehistoric humans to determine qualified informants; as the scope of society increased, this “protoknowledge” became objectivised into knowledge as questions concerning the accessibility or reliability of an individual informant faded into questions concerning the attributes of information itself. As such, Craig proposes an approach to epistemology which examines the ends of epistemology rather than following the more traditional analytic approach; and, throughout this interesting and informative collection, the debt to Craig’s thought is significant. In the review that follows, I will discuss some of the chapters which would be, in my opinion, of the most interest to those involved in social epistemology. I will then conclude with a discussion of some areas of further study proposed by this fascinating volume. The first chapter of the book is by Georgi Gardiner, and deals with what he describes as a teleological approach to epistemology. What is the end of epistemology? The immediate answer is “knowledge,” but of course that isn’t the goal at all, since as a result of Gettier the greatest achievement of epistemology in the latter half of the twentieth century was to problematize, not to create, knowledge. Craig goes so far as to suggest that the result is that the majority of the starting assumptions of modern epistemological discourses are “risky,” and suggests that a more appropriate starting point is to examine, within a social framework, the desired ends of epistemological inquiry. In a practical sense, as Kappel suggests, one has “knowledge” when one can cease inquiry; I have “knowledge” concerning the leak in my faucet when I accurately know that the leak is because of the washer at the base of the valve body; I can now stop my inquiry, having knowledge, and proceed to purchase a washer, gather tools, and commence repair work. Knowledge, in Gardner’s terms, is an “inquiry-stopper,” and the telos is hence sufficiency. One of Gardiner’s most intriguing points for the teleological approach to epistemology is his argument that it is relatively immune to skeptical challenges. Skeptical challenges, Gardiner argues, can be taken as attempts to deny agents epistemic states which agents may not claim to possess. Among these might be justified true belief, as shown by Gettier cases, or the variety of certainties confronted by Pyrrhonian skepticism. The teleological approach would, by providing examples of what agents seek to do and what they actually do, provide a “fall-back” position of sorts; for example, if people seek knowledge by gathering multiple testimonies, and if the statistical reliability of multiple testimonies can be shown to increase via Bayesian techniques, then how can it be argued that the information that law enforcement agencies thereby gather is not knowledge? If it is not, then what sort of item could the skeptic possibly accept as knowledge? Agents may not possess the ‘straw-man’ of justified true belief attacked by Agrippan skeptics, but does that of necessity mean they do not possess knowledge? Fricker continues by asking what conditions are the necessary antecedents for Craig’s initial teleological approach to epistemology. The thought experiment of a search for a “state of nature” in which knowledge doesn’t yet exist, which Fricker calls the “original situation,” leads to a paradoxical situation in which an individual must make utterances requiring knowledge before the knowledge of knowledge exists, Fricker suggests. The conventions of speech demand that utterances involve knowledge; nobody can say “Call me Ishmael,” without expecting that someone will later address them as “Ishmael” and knowing how to behave when thus addressed. Therefore, “Ishmael” must both be “called” Ishmael and know what behaviors are elicited when one is “called” Ishmael to utter the sentence “Call me Ishmael.” Were such knowledge not to exist, proto-knowledge could not form, nor could it evolve into knowledge. Thus, Fricker argues, the epistemic standard for knowing is intimately linked to the epistemic standard for uttering. A teleology of knowledge can be formed, therefore, by examining what is required for speech; one must know first, then speak, so implicit in speech is knowledge. Henderson and Horgan broaden the discussion of teleological epistemology on the basis of Henderson’s prior work in order to construct a generalized model of philosophical reflection. Reflection on specific cases leads to equally specific judgments, which is the deliverance of conceptual competence. Then the agent reflectively considers specific judgments, and from them derives a general and abstract judgment. Such an abstract judgment has a broadly empirical dimension in that competing explanations are compared for a sort of rough “goodness-of-fit” by the investigator. The epistemic community of which the investigator is a member learns of the investigator’s conclusions, and pays a lesser but still significant price to confirm the epistemic process by which the investigator arrived at her conclusion (whether or not the investigator practiced appropriate virtues). At that point, the epistemic community can serve as a source of reliable information, a process which Henderson termed “epistemic gatekeeping.” Such communities (such as editorial communities for journals) are contextual, Henderson and Horgan suggest; no one would argue that the Social Epistemology Response and Reply Collective be consulted on questions concerning Torah; if an agent has a question concerning Deuteronomy, the faculty of Jewish Theological Seminary might be the appropriate gatekeeping community. An extension of the conceptualization of a gatekeeping epistemic community is the idea that the notion of knowledge itself is evaluative, in that it is a judgement of the worth of an utterance. Considered as a goal, knowledge involves a set of practices involving praiseworthy practices such as gathering information upon which one might draw to engage in useful behaviors and to validate information and sources as members of a contextual epistemic gatekeeping community. These communities hold and distribute knowledge, determining what information is appropriate to which situations. Grimm’s chapter continues the discussion of the situational aspect of epistemology by considering the practical aspect of knowledge. I might say I ‘know’ where my belt sander is; it’s in the basement somewhere. That level of epistemic certainty is sufficient for what’s at stake; the belt sander will remain where it is, without problem, until I need to use it. But where is my insulin? To say my insulin is in the basement somewhere does not constitute satisfactory knowledge, and I will continue my search until I locate precisely medicine immediately necessary for my good health. As such, Grimm contrasts the intellectualist view (the notion that only truth-connected factors are related to a definition of knowledge, pace Stanley with a view he labels practicalism (the idea that non-truth factors, particularly the costs of being wrong, play a role in our epistemic considerations). For some authors—Grimm lists Foucault, Rorty and Hazlett—such non-truth goals and concerns are seen as the only factors which matter, a position which Grimm describes as largely implausible. The knower must, as Riggs suggests, balance their desire to achieve the truth on a given topic with their desire to avoid error on the topic; further, the knower must answer the “whose stakes” problem, and there is, as Grimm argues, no single manner of thinking about interests or concerns that gets every conceivable case right, leading to Zagzebski’s argument regarding the Evil Genius; if it is highly important to knowers that there be no Evil Genius deceiving them, then knowers can honestly say they know very little or nothing, and knowers can solve this dilemma only by not caring about knowledge. An example might clarify this position. At a lunch some time ago, a participant suddenly and with alarm asked, “Where’s Baby?” Another diner responded, “Out in the yard.” The other diners relaxed; I did not. Upon further inquiry, however, I was told that Baby was the name of the host’s dog. Until I knew that Baby was not a human infant, I lacked an epistemic position good enough from which to act reasonably, and thus, by my agitation, engaged in a moderately amusing social faux pas. We might argue that I had not performed my epistemic duties, failed to earned doxastic rights, and thus violated social norms of assertion, as Williams claims in his chapter in asserting that knowledge is a deontic concept. Williams advances the reliabilist repudiation of more traditional conceptualizations of epistemology; the agent must have some degree of awareness of the reliability of the processes by which she arrives at beliefs in order to justify those beliefs, and thus first-order knowledge requires some degree of second-order, reflective knowledge. Internalist approaches thus chase a “will-o’-the-wisp” in that such approaches sever the link between the ability to give reasons for knowing and capacity for knowing. In contrast, reliabilist accounts of knowledge do not demand the a priori treatment of knowledge which characterizes much of the traditional theorizing in epistemology, and the empirical treatment of knowledge means that naturalist approaches deal with basic cognitive capacities in a straightforward way. This externalist reliabilism describes a neo-pragmatism along the lines of that defined by Macarthur and Price; this pragmatism is a combination of the acknowledgement of two things: (1) the given that there is a common vocabulary in use in epistemic discourse, a fact which makes it possible to assume a metaphysically neutral stance in approaching such epistemic discourses; and (2) the inability to appeal to “truth” or “reference” in our consideration of such vocabularies, since all we have at hand is the use of those vocabularies. That sort of “linguistic priority” neo-pragmatism, grounded in Craig’s conceptualizations if not his genealogy, offers clear reasons why we might talk about straightforward physical observables like “sheep and corn,” as Williams puts it; but the question Craig addresses in his genealogical approach is more important for the epistemologist: Why do we talk about knowledge? Williams concludes that developing the concept of knowledge, even though it was already implicit in the act of speech, serves to make knowledge-sharing rules more powerful; to be able to ask “is this knowledge in this situation?” or “does this agent have knowledge?” is a way of inquiring about truth-reliability and epistemic responsibility in a manner which transcends the internalism-externalism debate and which can be used for the purpose of stopping Agrippan regress arguments. Weinberg extends the conversation about regress-stopping by arguing that the questions which govern epistemic projects not only enable agents to act in ways that make it more likely that they will form true beliefs; they also mean that agents will be able to respond in appropriate manners should additional justifications of those beliefs be required at a later point. Were there agents with comprehensive knowledge of their environment, and similarly comprehensive powers of coherence-based inference, such entities would be in no need of good epistemic rules possessing diachronic reliability and dialectic robustness, Weinberg argues; their current observations and inferential powers would suffice for any inferential deductions they might need to make. Similarly, agents with substantively limited reasoning powers would not have the capacity to gain additional information from even diachronically reliable and robust rules, nor could they gain additional information from whatever amount of knowledge of their environment they might possess. Human agents, Weinberg argues, lie between the gods and the beasts. Humans require a chain of reasons which enable better reasoning to be distinguished from lesser reasoning, and humans require that these inferential chains, once determined to be adequate, be finite, coming to a terminus within a reasonable amount of time. For the epistemic neo-pragmatist, perception is sufficiently reliable when mutually verified, and thus the standard skeptical objections, or the difficulties of “sense-data” justification and the like, can be considered as variants of infinite regress; our interior sensations, after all, are far less verifiable than our common perceptions of our environments. Is there, then, a consensus within the epistemic community, or even the neo-pragmatist or teleological epistemological community, on the internalism/externalism debate? As Goldberg (2015) suggests, that debate persists in such manner as to be an exemplar of a “widespread disagreement.” Particularly in 2013a, Goldberg has defended the notion that skeptical arguments founded on the notion that disagreements in which each position has substantial and fundamentally equivalent epistemic peer communities supporting the positions (as in the internalism/externalism debate) imply that the positions held by the respective groups are not epistemically justified. Thus they are certainly not justified true beliefs (“knowledge”) nor even “beliefs,” since it would be unreasonable to claim some strong doxastic status for such notions when one’s epistemic peers can offer relevant and equally strong arguments against those notions. In such a case, then, what is it that we do when we come down on one side or the other of the internalism/externalism debate, as indeed most of us do? We must, Goldberg argues, be saying that our position is epistemically proper, that it is warranted in the sense of being supportable; but since internalists and externalists differ on what kind of warrant is appropriate, the nagging sense that the two camps are “talking past one another” arises. Thus, as Goldberg suggests, the debate between internalists and externalists is indeed substantial without being readily tractable. Smithies broadens the discussion about warrant and justification to argue that Craig’s teleological approach, in a broad sense, can be used to limit theories of epistemic properties by asking how those properties operate in epistemic evaluation. Alston argues that the notion of epistemic justification stems from the idea of critical reflection; a justified belief is one which would survive critical evaluation and reflection by an idealized version of the agent (that is, a version of the agent who exercises their capacity to reflect in the appropriate way, and whose capacity to reflect is appropriate). Smithies argues that, while the analysis is circular in that this ideal reflective agent’s ability to engage in justification-producing reflection can not be explained without invoking the concept of justification, the analysis is not trivial; being conceptually committed to this sort of analysis as producing justification provides a basis for an argument for internalism, in that the agent who justifies must commit mental actions which are accessible for the agent for evaluation and reflection, as Alston proposes. Such an argument supports “having justification to believe a proposition” rather than “believing a proposition,” Smithies suggests, and this distinction between propositional and doxastic internalism avoids a variety of objections, particularly the “ought-implies-can” principle. Reflection, constituting the evaluation of epistemic stability under ongoing examination, is understood by Smithies to be the distinguishing characteristic of agents who can be held responsible for their actions—that is, persons—who are entities capable of praiseworthy or blameworthy acts. And since personhood is intrinsically valuable—who would dare to say that personhood isn’t valuable? —so is reflection, since reflection is indicative of personhood and thus epistemic justification, requiring reflection, is similarly valuable. Such social norms occur in almost every realm of human behavior, and Graham argues that such norms occur in the epistemic realm as well. The social norm that “lying is wrong” or “if someone needs information, and you have that information, you should provide it,” or “when communicating information, provide relevant and true information” are approximations of epistemic norms we might construct from speech-acts, or reconstruct in a project of a genealogy of epistemic history. Graham then appeals to Grice’s description of social norms in conversation, particular the norm of providing true and relevant information, to suggest that cooperative social norms have evolved on the topic of knowledge in much the same manner as they have on food-gathering and distribution. As Sober and Wilson argue, group selection presents a mechanism by which pro-social, cooperative social norms might be selected in a manner analogous to biological selection methods within evolutionary biology, with beneficial effect within those groups which select the most beneficial epistemic norms. Group epistemic norms would logically and empirically turn out to be instrumental norms, the ones which turn out to achieve good outcomes in terms of group survival. The final chapter in the volume is by Greco, and asks a series of important questions about testimonial knowledge. When a speaker asserts that something is the case, they make an epistemic claim, as do we when we say something along the lines of “I know the capital of Maine is Augusta, for I read it in a book (or, perhaps, ‘Googled’ it).” The major criticism against reductionist theories, that they make testimonial knowledge too hard, is obvious from the state capital example; if an agent won’t accept the testimony of a book (some books lie) or Google (some web sites lie) or a road sign, (it may have been misplaced) then what evidence will in fact suffice? The major criticism against anti-reductionist theories, that they make testimonial knowledge too easy, is similarly evident; if one accepts Google as an arbiter, then might one as well look up web sites describing Sasquatch sightings or other absurdities. As Greco suggests, the debate over transmission leads to a dilemma—an adequate account of any given testimonial is impossible since such accounts make testimonial knowledge either too hard or too easy. Greco proposes, however, that Craig’s teleological ideas about epistemology open up a way out of such a dilemma. Agents existing in a diversified community must have mechanisms both for gathering and for distributing information of high quality; in such a system, Greco argues, the norms of information distribution would be different from the norms of information acquisition. The norms of information distribution would be ease of access, while the norms of information gathering would be quality of information. Information distribution, hence, would come to depend on testimony, and sometimes information acquisition would depend on reliability and validity (although it might depend on testimony as well). By focusing on the transmission function of testimony, rather than arguing that testimony produces new knowledge, Greco is thus able to accommodate the importance of testimony in everyday life. Questions of why individuals seek to form epistemic regimes, and of what their purposes and goals might be, are clearly of significant importance in the study of understanding knowledge. The assumption that individual, or group, intentionality is of no interest, or is inherently opaque, has for too long made purposeful epistemology something that failed to develop as a research program. 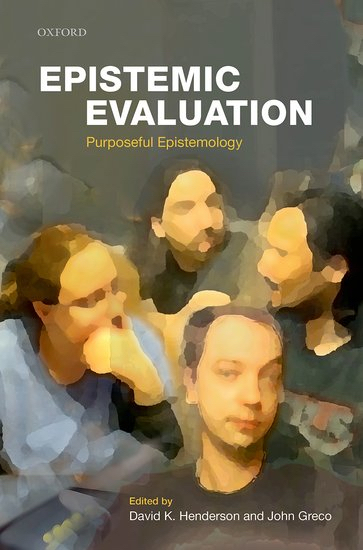 Epistemic Evaluation: Purposeful Epistemology is thus not only a useful book, recommended for those who are seeking a way out of the crisis inspired by Gettier; it is a description of how new research programs—and dare I say, a new epistemic community—can develop. I would argue that the community of social epistemologists are, by and large, in agreement that the action of individual agents, considered when those agents are embedded in social settings, is the fertile ground from which intuitions, theories and understandings of epistemic practices arise. But there are, it seems, concerns that the community of social epistemologists might want to consider while examining the well-written and thoughtful essays in this must-read book. I would like to briefly discuss one. As the Gettier problem suggests, the notion of ‘epistemic intuitions’ can be the final arbiter in debates about epistemic regimes; the long supremacy of ‘justified true belief,’ and its decline after the presentation of perverse cases such as Cohen’s ‘newspaper and cow’ or Gettier’s Case II (“Jones owns a Ford, or Brown is in Barcelona”) hinged on the way in which one’s intuitions about epistemology have normative force. Intuitions in many domains may suffer from a variety of biases (see, for example, Kahneman and Tversky on biases in statistical intuitions, or Nichols and Knobe for how cultural biases influence the attribution of moral culpability); but, as Bealer argues, intuitions end up being largely how we gain knowledge about justification, belief, and epistemology in general; and this can be demonstrated by the effect that the Gettier paradoxes have had on the field of epistemology. I have met no one who, after hearing Cohen’s “newspaper and cow” case, does not concur that the farmer has justified true belief but not knowledge; students who are untutored in epistemology, or indeed in philosophy, still see the farmer as lacking knowledge concerning the location of the cow; the farmer “knows” where the cow is, but she does not “have knowledge” of the cow’s location. The epistemic intuition that arises upon hearing a Gettier case, to follow Gardiner’s taxonomy in Chapter 1, may be an example of a linguistic approach triumphing over an “extension first” method; the linguistic distinction between “knowing” and “having knowledge” trumps the target theory that “knowledge is justified true belief.” Kornblith contends that intuitions are not sufficient for work in analytic philosophy—a notion that, to some, is appealing. Nevertheless, the intuition arising from hearing a Gettier paradox is sufficiently potent to lead the community of epistemic peers in the field of epistemology to doubt whether justified true belief is knowledge, and even philosophical traditions which are skeptical on the matter of philosophical intuitions are, at the final recourse, dependent upon them. To turn away from the value of intuitions concerning epistemological questions is to argue against what Zagzebski called the “inescapability” of Gettier problems, and those problems may be inescapable because they point to aporia in how we use language. We may not have reached the point where, in the domain of epistemology, the explicandum, to use Carnap’s terminology, does not map onto an explicatum with substitution salva veritate. Our intuition is ahead of our theory, it would seem; and if this explanation is true, as the historicity of the “inescapability” of Gettier problems would indicate, then it is an interesting question how a further genealogical project, despite its own intuitive appeal, would evade them. Epistemology is a field in ferment. The decades of dominance of analytic approaches has faded, but no new approach has come to the fore to replace it. This book foregrounds a novel methodology, perhaps best described as the teleological approach, which is at least in some aspects social and psychological in nature. Greco’s initial movement toward a teleological approach was burdened with quasi-historical surmises, difficulties connected with knowers whose ability to communicate were limited, and by the assumption that there is a central corpus of knowledge we possess—a sort of ontology which makes understanding possible. Later approaches to the question of why we seek knowledge have clarified the relation of ontology to epistemology, and of teleology to epistemology, without the quasi-historical thought experiment that Craig used as a starting point for his explorations, and the now-disputed notion that the goal of the concept of knowledge was to identify good informants. Brandom’s movement toward the explication of how social norms govern the use of terms, and the innovative and interesting research programs described in this book, outline a vibrant corpus of research seeking to answer the question of why we seek to know about knowledge. As Kelp succinctly puts it, what is the point of knowledge? Why do we seek knowledge? When the question is put in such direct terms—such teleological terms—the terminus ad quem must be something like eudaimonia, which we move toward via the ability to function in the world. Thus knowledge enables better functioning via correct understanding of things, and thus “truth” (as correspondence) enters the picture. The idea of knowledge for knowledge’s sake, which Craig and Kelp have termed the “traditional” project, has not only failed after Gettier, but even were it to succeed would be inadequate on teleological terms. As this volume elegantly demonstrates, such an observation means that a teleological program à la Craig is imperative, and such a teleological program inherently moves the inquiry into the realm of the social. The authors of this volume are to be commended for demonstrating the breadth of a wide-ranging research program that is, simultaneously, coherent in its intellectual debt to Craig’s Knowledge and the State of Nature. The program is, as Brandom suggests of the neo-pragmatic teleological program as a whole, “irenic, synthetic and constructive,” for which the authors are to be commended. The program also demonstrates the impact a single research project can have when it takes a new and appealing approach to even the most difficult problem, attacked by the most subtle minds for centuries. Suitable for a focused graduate course, or for those interested in how the social realm impacts the epistemic, this book is highly recommended for the specialized audiences likely to read this review. Alston, William P. Epistemic Justification: Essays in the Theory of Knowledge. Ithaca, NY: Cornell University Press, 1989. Bealer, George. “Intuition and the Autonomy of Philosophy.” In Rethinking Intuition: The Psychology of Intuition and its Role in Philosophical Inquiry, edited by Michael DePaul and William Ramsey, 201-239. Oxford: Rowman & Littlefield, 1998. BonJour, Laurence. The Structure of Empirical Knowledge. Cambridge, MA: Harvard University Press, 1985. Brandom, Robert B. “Toward an Analytic Pragmatism.” Philosophical Topics 36, No. 2 (2008): “On Between Saying and Doing” (Fall), 1-27. Brandom, Robert B. Between Saying and Doing: Towards an Analytic Pragmatism. New York: Oxford University Press, 2010. Brandom, Robert B. Perspectives on Pragmatism: Classical, Recent, and Contemporary. Cambridge, MA: Harvard University Press, 2011. Cohen, Martin. 101 Philosophy Problems. Routledge: New York, 2013. Fogelin, Robert J. Pyrrhonian Reflections on Knowledge and Justification. Oxford: Oxford University Press, 1994. Fricker, Elizabeth. The Epistemology of Testimony, Proceedings of the Aristotelian Society (Supplementary) 61 (1987): 57-83. Fricker, Elizabeth. “Critical Notice: Telling and Trusting: Reductionism and Anti-Reductionism in the Epistemology of Testimony.” Mind 104 (1995): 393-411. Gardiner, Georgi. “Teleologies and the Methodology of Epistemology.” In Epistemic Evaluation: Purposeful Epistemology, edited by David K. Henderson and John Greco, 31-45. Oxford: Oxford University Press, 2015. Gettier, Edmund L. “Is Justified True Belief Knowledge?” Analysis 23, no. 6 (1963): 121-123. Goldberg, Sanford. “Defending Philosophy in the Face of Systematic Disagreement.” In Disagreement and Skepticism, edited by Diego E. Machuca, 277-294. New York: Routledge, 2013a. Goldberg, Sanford. “Disagreement, Defeat, and Assertion.” In The Epistemology of Disagreement: New Essays, edited by David Christensen and Jennifer Lackey, 167-189. Oxford: Oxford University Press, 2013b. Goldberg, Sanford. “What is the Subject-matter of the Theory of Epistemic Justification?” In Epistemic Evaluation: Purposeful Epistemology, edited by David K. Henderson and John Greco, 205-223. Oxford: Oxford University Press, 2015. Graham, Peter J. “Epistemic Normativity and Social Norms.” In Epistemic Evaluation: Purposeful Epistemology, edited by David K. Henderson and John Greco, 247-273. Oxford: Oxford University Press, 2015. Greco, John. “The Value Problem.” In Epistemic Value, edited by Adrian Haddock, Alan Millar and Duncan H. Pritchard, 313-322. Oxford: Oxford University Press, 2009. Greco, John. Achieving Knowledge: A Virtue-Theoretic Account of Epistemic Normativity. Cambridge: Cambridge University Press, 2010. Greco, John. “Testimonial Knowledge and the Flow of Information.” In Epistemic Evaluation: Purposeful Epistemology, edited by David K. Henderson and John Greco, 274-290. Oxford: Oxford University Press, 2015. Grimm, Stephen R. “Knowledge, Practical Interests, and Rising Tides.” In Epistemic Evaluation: Purposeful Epistemology, edited David K. Henderson and John Greco, 117-137. Oxford: Oxford University Press, 2015. Hájek, Alan and Stephan Hartmann. “Bayesian Epistemology.” In A Companion to Epistemology, edited by Jonathan Dancy, Ernest Sosa, and Mattias Steup, 93-106. Wiley-Blackwell, 2010. Hillier, Sam. “Mathematics in Science: Carnap versus Quine.” History of Philosophy Quarterly 26, no. 4 (2009): 409-420. Henderson, David. “Motivated Contextualism.” Philosophical Studies 142, no. 1 (2009): 119-131. Henderson, David. “Gate-Keeping Contextualism.” Episteme 8, no. 1 (2011): 83-98. Henderson, David. and J. Greco. “Introduction: The Point and Purpose of Epistemic Evaluation.” In Epistemic Evaluation: Purposeful Epistemology, edited by David K. Henderson and John Greco, 1-28. Oxford: Oxford University Press, 2015. Henderson, David. and Terence Horgan. “What’s the Point?” In Epistemic Evaluation: Purposeful Epistemology, edited David K. Henderson and John Greco, 87-114. Oxford: Oxford University Press, 2015. Kahneman, Daniel and Amos Tversky. “On the Study of Statistical Intuitions.” Cognition 11, no 2 (1982): 123-141. Kappel, Klemens. “On Saying that Someone Knows: Themes from Craig.” In Social Epistemology, edited by Adrian Haddock, Alan Millar, and Duncan Pritchard, 69-88. Oxford: Oxford University Press, 2010. Kelp, Christoph. “What’s the Point of ‘Knowledge’ Anyway?” Episteme 8, no. 1 (2011): 53-66. Klein, Peter D. “Human Knowledge and the Infinite Regress of Reasons.” Noûs 33, Issue Supplement s13 (1999): 297-325. Klein, Peter. “Human Knowledge and the Infinite Progress of Reasoning.” Philosophical Studies 134, no. 1 (2007): 1-17. Kober, Michael. “Certainties of a World-Picture: The Epistemological Investigations of On Certainty.” In The Cambridge Companion to Wittgenstein, edited by Hans D. Sluga and David G. Stern, 411-441. Cambridge: Cambridge University Press, 1996. Kornblith, Hilary. “Epistemic Normativity.” Synthese 94, no 3 (1993): 357-376. Kornblith, Hilary. “Naturalism and Intuitions.” In Grazer Philosophische Studien: Philosophical Knowledge Volume 74, edited by Christian Beyer and Alex Burri, 27-49. Amsterdam: Rodopi, 2007. Kornblith, Hilary. “Belief in the Face of Controversy.” In Disagreement, edited Richard Feldman and Ted Warfield, 29-52. Oxford: Oxford University Press, 2010. Kusch, Martin. “Knowledge and Certainties in the Epistemic State of Nature.” Episteme 8, no. 1 (2011): 6-23. Macarthur, David and Huw Price. “Pragmatism, Quasi-Realism, and the Global Challenge.” In The New Pragmatists, edited by Cheryl Misak, 91-120. Oxford: Oxford University Press, 2007. McGrath, Matthew. “Two Purposes of Knowledge-Attribution and the Contextualism Debate.” In Epistemic Evaluation: Purposeful Epistemology, edited by David K. Henderson and John Greco, 138-157. Oxford: Oxford University Press, 2015. Nagel, Jennifer. “Epistemic Intuitions.” Philosophy Compass 2, no. 6 (2007): 792-819. Nichols, Shaun and Joshua Knobe,.“Moral Responsibility and Determinism: The Cognitive Science of Folk Intuitions.” Noûs 41, no. 4 (2007): 663-685. Owens, David. Reason Without Freedom: The Problem of Epistemic Normativity. Routledge, 2002. Plato. The Theaetetus of Plato. Translated Myles Burnyeat. Indianapolis: Hackett Publishing, 1990. Pope, Whitney. “Durkheim as a Functionalist.” Sociological Quarterly 16, no. 3 (1975): 361-379. Pust, Joel. “Against Explanationist Skepticism Regarding Philosophical Intuitions.” Philosophical Studies 106, no. 3 (2001): 227-258. Smithies, Declan. “Why Justification Matters.” In Epistemic Evaluation: Purposeful Epistemology, edited by David K. Henderson and John Greco, 224-244. Oxford: Oxford University Press, 2015. Sober, Elliott and David S. Wilson. Unto Others: The Evolution and Psychology of Unselfish Behavior. Cambridge, MA: Harvard University Press, 1999. Stanley, Jason. Knowledge and Practical Interests. Oxford: Oxford University Press, 2005. Swinburne, Richard. Epistemic Justification. Oxford: Oxford University Press, 2000. Weinberg, Jonathan M. “How to Challenge Intuitions Empirically Without Risking Skepticism.” Midwest Studies in Philosophy 31, no. 1 (2007): 318-343. Weinberg, Jonathan M. “Regress-Stopping and Disagreement for Epistemic Neopragmatists.” In Epistemic Evaluation: Purposeful Epistemology, edited by David K. Henderson and John Greco, 186-202. Oxford: Oxford University Press, 2015. Weinberg, Jonathan M., Shaun Nichols, and Stephen Stich. “Normativity and Epistemic Intuitions.” Philosophical Topics 29, no. 1&2 (2001): 429-460. Williams, Michael. “Knowledge in Practice.” In Epistemic Evaluation: Purposeful Epistemology, edited by David K. Henderson and John Greco, 161-185. Oxford: Oxford University Press, 2015. Zagzebski, Linda. “The Inescapability of Gettier Problems.” The Philosophical Quarterly 44, no. 174 (1994): 65-73. Zagzebski, Linda. “Epistemic Value Monism.” In Ernest Sosa and His Critics, edited by John Greco, 190-198. Malden, MA: Blackwell Publishing, 2004. Zagzebski, Linda. On Epistemology. Scarborough, Ontario: Nelson Education, 2008. Plato, tr. Myles Burnyeat 1990. David K. Henderson and John Greco 2015. Henderson and Greco 2015, 3. Alan Hájek and Stephen Hartmann 2010. David Henderson and Terence Horgan 2015. David Macarthur and Huw Price 2007. Peter D. Klein 1999; 2007. Hilary Kornblith 2010; Goldberg 2013a, 2013b. Smithies draws a useful distinction between ‘persons,’ understood to be agents capable of being held responsible for their actions, and ‘humans,’ understood to be entities of a branch of the taxonomical tribe Hominini, which, in turn, belong to the family of great apes. ‘Persons’ could thus include other intelligences, biological or mechanical or of yet unknown origin. Elliott Sober and David S. Wilson, 1999. John Searle 1969; Fricker 1987, 1995. Jonathan M. Weinberg, Shaun Nichols, and Stephen Stich 2001. Daniel Kahneman and Amos Tversky 1982. Shaun Kichols and Joshua Knobe 2007. Jennifer Nagel 2007; Sam Hillier 2009. Robert B. Brandom 2008; 2010; 2011. This sounds like a wonderful book, and I’m glad such essays are being written and read in North America’s epistemology community. When I was doing my doctorate, I made some good friends among my colleagues, who were pretty traditional analytic epistemologists. One thing they found frustrating was trying to wrap their heads around Gettier cases – the ultimate skeptical setups for the traditional theory of knowledge. The idea that knowledge was a social, shared, community matter always made the most sense to me. But it seems that this conception of knowledge as an individual’s specific possession is so firmly lodged in the community, they could never get around it. If this essay collection constitutes a case as strong as West’s review suggests, this might be the final blow to end a confrontation that’s seriously stymied the traditional epistemology community. For years, it seems the field has been trying to refute Gettier head-on. But the best way to overcome him is to change your model of how knowledge works entirely – admit that the Gettier case really has broken the individualistic model of knowledge as an individual’s justified true belief. It can’t be saved, so it mustn’t be the right path. Having seen so many people lecture undergrads on the importance of fallibility and falsifiability for scientific knowledge, it still kind of amazes me how many professional philosophers in the academy will hold on to a paradigm that just can’t be made to work anymore.